Skutt Studio Kilns are the most popular among serious home glass fusers. 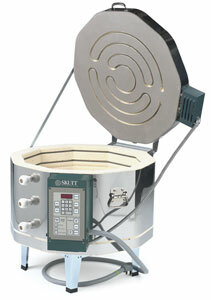 GM1014 features include the GlassMaster Controller, lid and side-fired elements, and a low mass Type K thermocouple. A stand, control box, and porcelain peep plugs are also included. The round shaped Model GM1014 has chamber dimensions 23½" × 13½". Fire to a maximum temperature of 1800°F. Shipping weight is 174 lb.